It’s the telegram Constance Clarke never wanted to read: “DEEPLY REGRET TO INFORM YOU LT-CMDR H CLARKE LOST IN ACTION. CLASSIFIED OPERATIONS.” Those classified operations concerned a top-secret military project code-named ‘Quicksilver’. A project based in Vienna. A project with alien connections. But bombed-out Vienna is not what it was before the war – with its Strauss music, its glamour and its easy charm. It’s not the time nor the place for a happy reunion, as Constance is about to discover… And as the Doctor is about to discover, too…! In the concluding story in the latest Sixth Doctor / Constance Clarke trilogy, Mrs Clarke (Miranda Raison) has decided to face reality and return to her own time. She is well and truly brought back down to earth when she finds that one of the items of correspondence waiting for her on the doormat at home is a telegram of condolence regarding the passing of her husband Henry (Matthew Cottle) while on a covert mission. The poignancy of this revelation is heightened by the inclusion of a flashback to the last time the couple were together (listeners have previously heard about but never actually met Henry). This story has been described as Doctor Who does The Third Man, though that’s not a comparison I would have made, on account of the fact that I’ve never actually seen The Third Man – I know, I am duly ashamed! (“This means nothing to me. Ohh, Vienna…”) So for me the espionage plot (including meetings on Vienna’s famous Ferris Wheel), reminded me more of The Living Daylights (“Ohhh, the living daylights…” OK, that’s enough of the Eighties lyrics now). Cottle makes a refreshingly different sort of spy – meek and mild rather than butch and domineering. Constance is the more assertive one in this marriage. 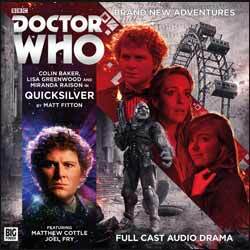 Meanwhile, the Doctor’s former travelling companion Flip Jackson (Lisa Greenwood) returns, courtesy of a rather circuitous time-travel tactic on the part of the Vilal and writer Matt Fitton. To be honest, I had forgotten that dialogue in The Widow’s Assassin had already resolved Flip’s precarious fate at the end of Scavenger (I needed to look it up on the internet to bring myself up to speed). It’s certainly more satisfying and memorable to have Flip back in person rather than just referred to verbally, and she provides a welcome contrast to Constance – or “Connie”, as she takes to calling her. These two women are from disparate eras, and their characters could hardly be more different: one a straight-talking former shop girl, the other a stiff-upper-lipped Wren. They also come from opposite ends of the marital spectrum: Mrs Clarke, after years of marriage, has just lost her husband, whereas Flip is only just embarking upon her married life – and experiencing some Amy Pond style cold feet. I think this is the beginning of a beautiful friendship, as we have a third man (sorry, person) aboard the Sixth Doctor’s TARDIS for a change.